Extracts from the Explanatory reports – Decisions for the buildings’ characterization as monuments of the modern times. In the village’s central street, a few meters from the great church of Saint Miron an old traditional residence is preserved until this day. It is a two-storey building, some parts of which are lodged under a tiled wooden roof while others have an attic. The building is developed in levels, following the ground’s formation. A small yard and three entrances are formed in this way. The habitation consists of two units, the main residence and the auxiliary spaces. The building was constructed on the first decades of the 20th century, according to oral witnesses. The street facade is structured symmetrically, featuring evident late neoclassicism elements, such as stone panels, frames, galleries, corbels with an elaborate railing. On the ground-floor, the orifices bear stone panels, a cornice, and a stone discharging arch, while the shutters are wooden and nailed. The main entrance presents special morphological interest, since it is crowned by a singular gable. On its stone case, formulated elements of the late neoclassicism coexist, whereas onthe gable there are elements borrowed from the oriental art. There has also been a formulation with neoclassical elements on the window next to the main entrance. The orifices have not been placed on strict symmetry axes, obviously in order to better serve the building’s interior spaces. On the building’s south-eastern side, there is an entrance with a stone arched case that leads to the yard. In the small yard there is a large traditional oven with chiseled stone elements, a well, flower-beds formed of chiseled stones and stone tiles. In addition, in the building’s interior, there are two large fireplaces, niches (where a jug could be placed), chiseled stone stairs and a wooden ontas (small elevated room)." The buildings operating as traditional lodgings have been characterized as monuments of the modern times by the Direction of Modern and Contemporary Architectural Heritage.. 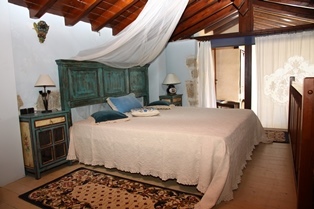 The rooms have a unique view to the peaks of Youhtas and Psiloritis, the sea and the rich local vegetation, which is full of olive groves, vineyards, pines, poplars, cypresses and fruit-bearing trees. The cottages operate all year round and offer to their visitor all modern comforts. 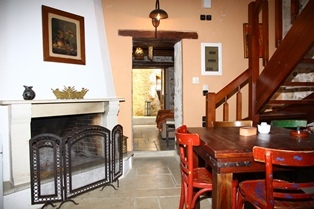 The apartments are three-bed and four-bed ones, fully equipped, with a telephone, a refrigerator, an electric cooker, air-conditioning, central heating, a safe, a living-room with a fireplace, a television set, while there is an Internet connection. All rooms have their own bathroom, hydromassage and a common vapor-bath. The buildings have a washing machine, a dishwasher, a freezer, and a fully equipped kitchen. 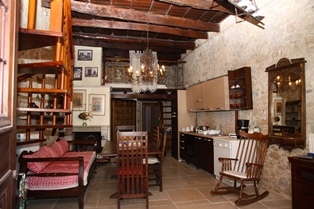 In their interior, the rooms are warm and welcoming. In the yard, there is an oven shed with a traditional pergola and a well. A rich breakfast is offered featuring every kind of coffee, chocolate, aromatic Cretan herbs and natural juices. Upon request, wines, rich salads or meals, which are traditionally cooked in the old wood oven in our yard, are served. Transport from & to the airport – port. Tour in the surrounding area. Planning of excursions and visits to wineries and organic agriculture farms. 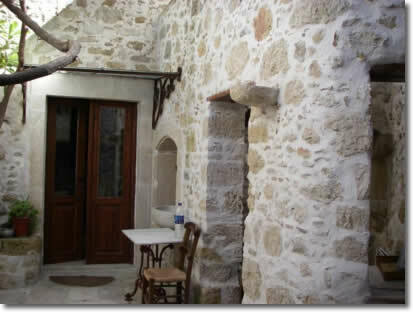 Are acquainted with the Cretan way of life and the Cretan diet, by visiting the near-by villages. Visit the proximate monasteries and churches Gorgolaini, Paliani, Aghia Eirini. The Asites Folklore Museum is situated at a 5 minute distance by car. In Pentamodi, at a few minutes distance from us, there is a riding center, with a traditional tavern, while, in cooperation with the Heraklion mountain club and Cretan Adventures, we can help you organize your own excursion, including outdoor sports, trekking, mountaineering, mountain biking, etc. The sea is at a distance of just 12 km. from the “Traditional Cottages”, where organized beaches await you to enjoy swimming and various water sports (surfing, sailing).